For more information click on the hole number. The Marianske Lazne Golf Club course may serve as an example of Scottish and Irish golfing architecture from the end of the 19th century. The course lies on an upland plain 787 meters above sea level, built under the governance of Scottish professional Robert Doig of Musselburgh. It was opened in 1905. Therefore it is the oldest course in The Czech Republic. The course forms a clearly bounded area. 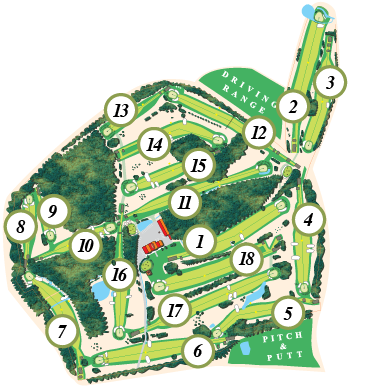 Only holes No.2 and 3 go out of the compact course boundaries. They were built in 1978 to replace the non-regular old ones. The greens are relatively small (but well protected by bunkers), especially when compared with newly built courses. Most of the course lies on a plain terrain. It seems to be easy at first sight. However, players find many hazards and places demanding an accurate and technical play. It is surrounded by a pine forest so that even on very hot days, it is a fine place to be. The surrounding picturesque landscape is natural, not harmed by any construction or buildings. The air is full of oxygen and saturated with ozone, so that it is a real cure for your lungs. With its “Indian summer” and beautifully coloured leaves, autumn will conjure up an idea of a golfer’s paradise. This description of the course is taken from the book titled “Klíč k českým golfovým hřištím” (Key to Czech Golf Courses) (Kargomedia publishing house). Petr Mrůzek is the author of the description of the course in Mariánské Lázně.